Focusrite has added the AM2 stereo audio monitoring unit to its RedNet range of Dante audio-over-IP products. RedNet AM2 is a Dante-compatible stereo monitoring unit that combines headphone and line outputs for flexible monitoring of signals sourced from the Dante network. 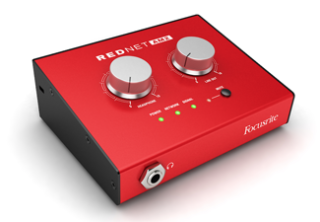 RedNet AM2 features a 1/4-inch front-panel headphone jack plus a pair of balanced line outputs with male XLR connectors mounted on the rear panel, which may be used for loudspeaker monitoring and other applications. RedNet AM2 has non-slip feet, so it can either sit securely on a flat surface or be mounted on top of a mic stand using a standard, threaded bush in the base. RedNet AM2 includes a two-channel Dante receiver based around the latest Ultimo hardware, allowing up to 24-bit, 96 kHz operation, and features an aluminium, extrusion-based enclosure. Two large volume control knobs are provided for Headphone and Line output levels, the latter of which also features a mute button with an associated LED. Other indicators show the presence of power, network, and signal. The unit may be powered either via PoE (Power over Ethernet) or via the 12V DC input barrel connector, ans a universal power supply is included. Dual etherCON connectors are included to connect the network and to daisy-chain to additional network devices. Focusrite plans to ship the RedNet AM2 in Spring 2016.